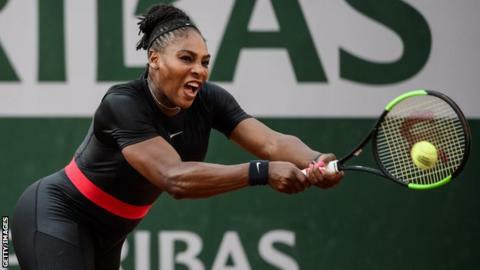 Serena Williams will be banned from wearing her black catsuit at the French Open in the future, with the tournament set to introduce a stricter dress code. The 23-time Grand Slam champion said the outfit made her feel like a "superhero" at Roland Garros this year. She claimed it helped her cope with the issue of blood clots, which she said almost cost her her life giving birth. "It will no longer be accepted," French Tennis Federation president Bernard Giudicelli told Tennis magazine. "I believe we have sometimes gone too far. You have to respect the game and the place." Williams says she spoke to Giudicelli on Friday, insisting the decision was "not a big deal". "The Grand Slams have the right to do what they want to do," said the three-time Roland Garros champion. "If they know that some things are for health reasons then there's no way that they wouldn't be OK with it." She dedicated the outfit to new mothers and said it made her feel like a "queen from Wakanda" in reference to the Black Panther movie. Williams is bidding for a seventh US Open title when the tournament starts on Monday and the 17th seed faces Poland's world number 60 Magda Linette in the first round.